As a child, I was terrified of the dark. I still am, to a lesser extent. In order to move around my house at night, I must turn a light on in whatever room I’m in, even if I’m just going the 10 feet down the hall to the bathroom. I remember one night, when I was about seven years old and my five year old sister woke up screaming about an alligator living under the blankets and that it had come up and bit her on the finger. Even though our parents assured me it was a nightmare, I was sure that the ghost of a very mean alligator was living in our room. After having a similar nightmare myself, involving a python wrapping itself around my wrist and trying to pull me underneath the bed, my parents bought us a night light. Being afraid of the dark is a common sleep problem of young children, even those raised with AP. These fantasies can turn real things into scary creatures. “The ability to imagine monsters without the ability to reason them away as imaginary creatures results in a developmental stage where little persons are likely to have big fears,” according to AskDrSears.com. Helping your child cope with his fear of darkness may be stressful to parents, especially if the child was previously sleeping soundly through the night. But, this challenge also provides opportunity for parents to strengthen their child’s trust in their relationship, by helping them to accept their changing world and overcome their fears. 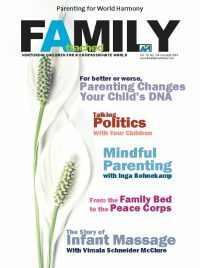 Help your child explore her fear – On The Parent Report Radio Show’s article “Fear of the Dark,” at www.theparentreport.com, psychologist John Munn suggests asking your child questions to help her understand her fear on her own and to let her know that you care about her feelings. 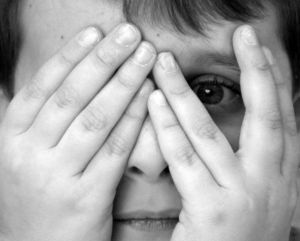 Help your child understand the real root of her fears – As explained on AskDrSears.com, one case of fear of the dark was “cured” by explaining to the child that his imagination was growing. Once he learned that there was a reason for his sudden fear of the dark, it seemed to help him relax at night and work through his fear. Co-sleep with your child, or have your child sleep with her siblings – Just having another person nearby can help make the night less scary. Lead by example – According to AskDrSears.com, young children learn how to be afraid of something just as they learn how to do everything else: By watching you. If you act afraid of the dark, so will your children tend to. Use a night light – Because the fear of darkness is actually the fear of what can be imagined is out there when we can’t see, a night light lessens the engulfing feeling of a pitch black room. Give your child a flashlight – Empower your child to conquer the darkness by giving her a way to shine a light on a scary object or a dark corner anytime during the night. Play night games – AskDrSears.com advises parents to play games at dusk and in the dark, like tag and hide-and-seek, to help lessen children’s fears through exposure. Help your child explore the dark during the day time – Keyes advises parents to talk with the child about her fears when it’s daylight and what in their room looks scary at night. Parents might want to consider moving furniture, large toys, or other items that create frightening objects in the dark. Let your child help to “redecorate” her room; children who are more comfortable with their surroundings have less fear of the dark. Turn off the TV – Get rid of scary images for a preschooler’s imaginative mind by limiting your child’s exposure to television shows and videos, especially any program or movie rated for older children and adult viewing. Watch out for phobia – Most children are afraid of the dark, but this fear doesn’t turn into a phobia. Signs of a phobia, say Munn, include: increasingly being afraid to go into their bedroom at night, with the lights turned off; increasingly being afraid to go into a darkened basement or outside in the dark; if their bedtime fear of the dark becomes increasingly more difficult for the child; or if the fear of the dark doesn’t go away as the child grows old enough to be able to understand what goes on in his world. Helping your child cope with his fear of darkness provides opportunity for parents to strengthen their child’s trust in their relationship, by helping them to accept their changing world and overcome their fears. Previous PostDiscovering On-Demand BreastfeedingNext PostWhat is Parental Alienation?